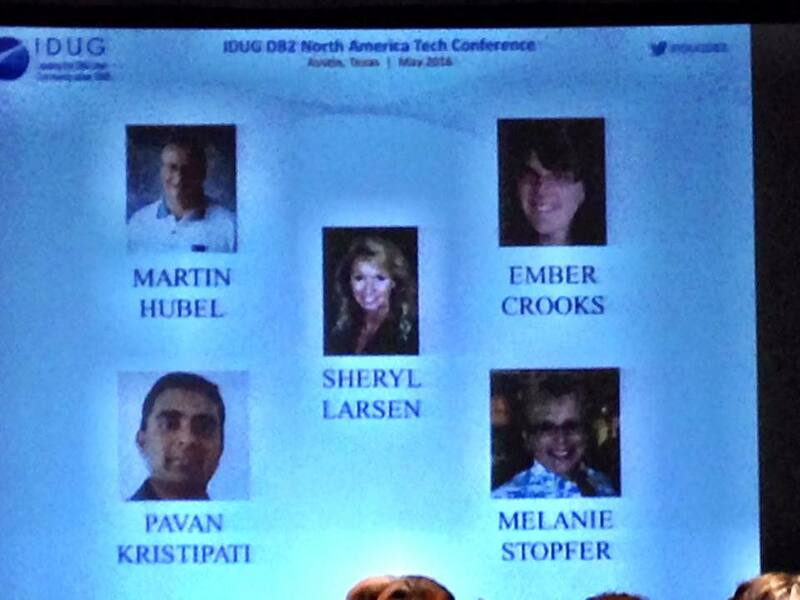 Sigh, IDUG NA is over for another year. It continues to be my favorite week of the year. I look forward to it more than a vacation. I always come away feeling inspired and refreshed, and this year is no different. 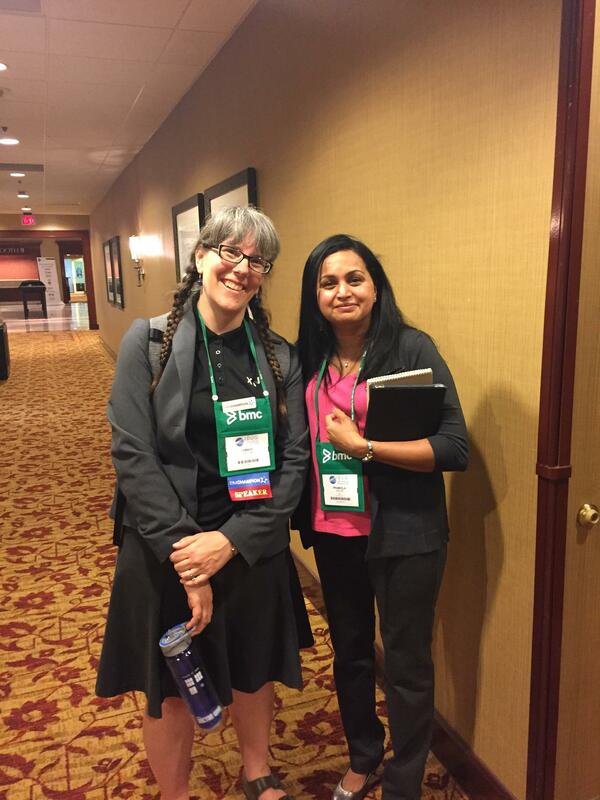 The highlight of the conference for me is meeting all of my readers. People come up to me and tell me they read the blog and what it means to them, how it helped them, or specific topics or articles that they enjoyed. This is a huge ego boost for me and sustains me with the motivation to keep blogging for months. I feel famous for a week. As odd as that feels to an introvert, it also feels really good to know that in my own way, I really am contributing something to the world. Second favorite are the technical sessions. Steve Rees blew my mind on the final day, and that alone made my conference. I will immediately be playing with and implementing statistics event monitors. How could I not have known they existed? The conference started with by best friend Mike Krafick’s presentation on HA and DR at the Same Time. Mike had enlisted me to toss some juggling balls around to illustrate what happens in the various Sync modes. He neglected to tell me, however that he would be tossing all of the juggling balls at me to simulate what happens during a reorg. It actually gave me some great ideas for how I can incorporate more kinesthetic elements in my own presentations. My own sessions went well. 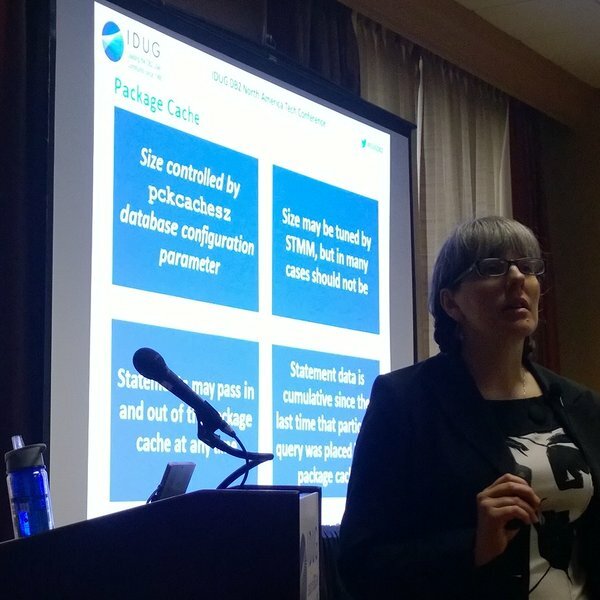 On Monday afternoon, I presented about the package cache. It went really well – I had a lot of questions and interaction, which I love. 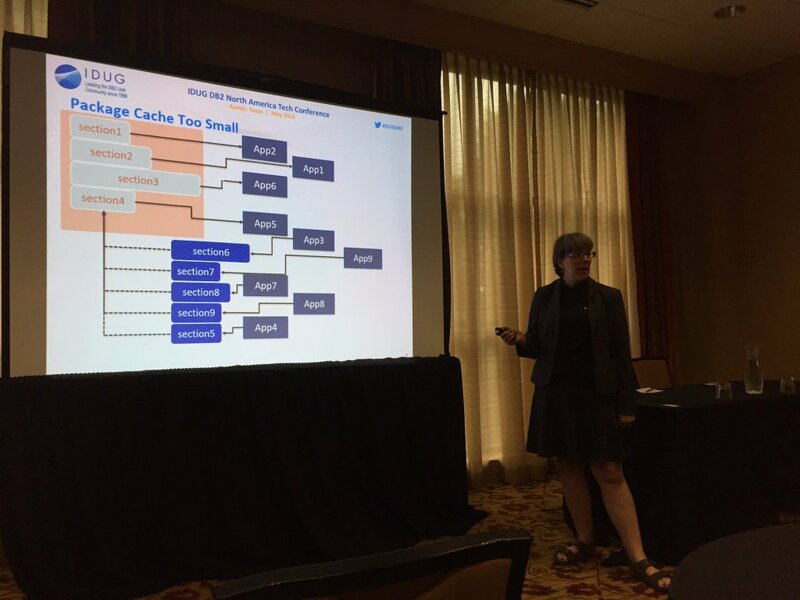 On Wednesday morning, I presented about seven high-impact performance tuning tips for OLTP and e-commerce databases. I had a respectable turnout for an 8 AM session when up against Dale McInnis. I’ll be reading Dale’s presentation as I talked to him and it sounded like he had some great tips on tuning backups. Great picture, Fred, thanks for taking it. C15: DB2 Performance FAQs vol. 6 by Steve Rees Steve Rees is always one of my favorite presenters. But I would note that it is difficult to completely blow my mind at this point in my DB2 career. I still learn so much at conferences, but usually in fairly expected ways. Statistics event monitors are a revolutionary concept for me, and I cannot wait to play with, implement, and write about them. Based on some parameters in table functions and columns out there, I thought there was something like this, but I had assumed it was something related to DSM or a future feature. You will hear more from me on this. G10: “I’m a DBA, Not a Developer!” With Apologies to Dr. Lenoard McCoy by Ken Shaffer Ken has really come into his own on presenting. He has a great sense of timing, and is good with humor while presenting great material. C04: Zen and the Art of Database Performance I came out of this session with 5 different blogging ideas and some thoughts on how to look at a particularly sticky performance problem that I have been working on lately. E12: The Times They Are A Changin’ NoSQL and NewSQL for a DB2 DBA by Adam Storm Adam is one of my favorite presenters, and this session did not disappoint. Adam was speaking to the choir on the advantages of RDBMSes for certain scenarios and the under reported issues with NoSQL and NewSQL systems. 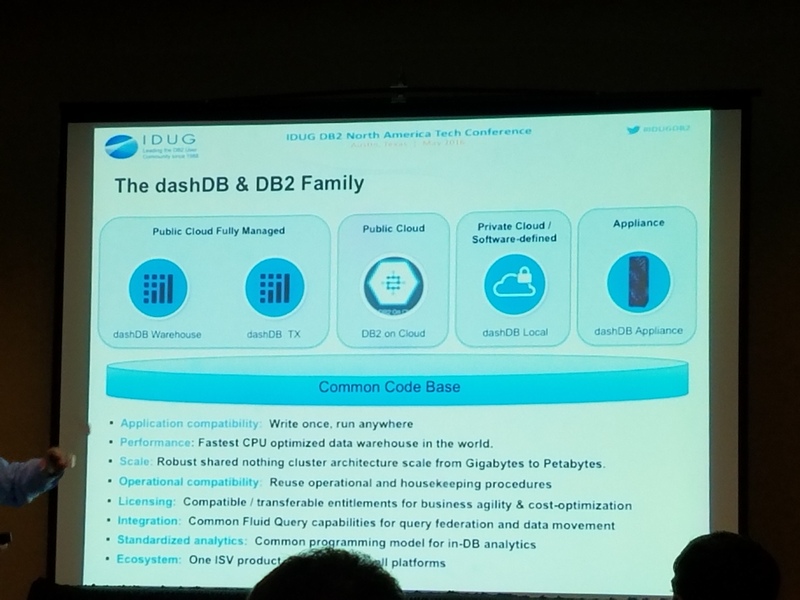 I think that all DBAs should be aware of the material in this presentation, and hope to blog about this in the future. LUW Mini Panel This remains one of my favorite sessions of the conference, as I learn from the questions that people are asking more than from the experts. I have several blog article ideas from this one, including thinking that I need to blog more on DSM. Each year there is so much going on that I have to make choices. Usually my first choice is to support a few friends and at least one new speaker. I was sad that I could not find the time to listen to Saurabh Agarwal, Abhik Roy, Fred Sobotka, or Ian Bjorhovde’s sessions this year – even in this area there are choices that I have to make when things conflict. These are both people I want to encourage and people that I know I learn from. Finally, I chose sessions on topics that I want to focus on or work on. There were many others that I would have enjoyed and loved to see as well. For the most part, I could print most of the grid here. In the opening keynote, I found the mention of “BLU Spark” or whatever the unoffical name for it is was interesting. Guy Lohman seemed to be demoing research on this at IBM Insight in 2015. Perhaps the most exciting part of the spotlight was the announcement that will now be offered on AWS (Amazon Cloud). I like this option since it makes getting up and running with DB2 even easier and can be something that a company can easily add in with a vendor they already work with. Tuesday’s keynote was by far the best of the conference. I had serious issues with the suggestion that tea could cure or prevent diabetes – perhaps type II, but not type I like I have. Other than that, Scott’s presentation was inspiring and much smoother than the other keynotes. I was honored to be one of five people that Scott honored during the keynote. The evening events and social things are also a fun part of a conference. I hang out in the solutions center a fair amount, and enjoy most of the evening events. 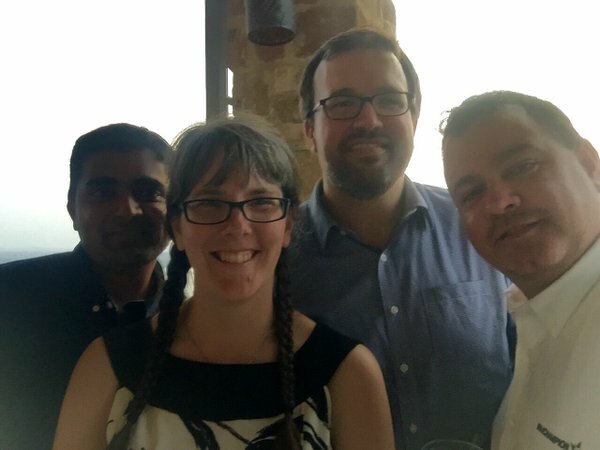 The Oasis on Lake Travis was beautiful on Wednesday evening, and it was so fun to actually get out of the conference hotel for an evening event. The t-shirts for the event are excellent, and actually something I’ll wear at other times. 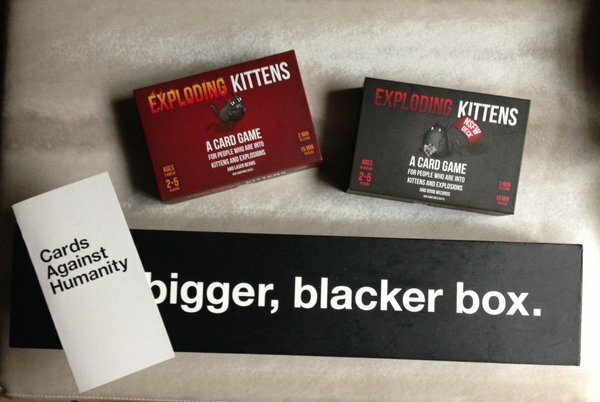 Perhaps the most fun for me the last two conferences has been getting a small group of friends together to play some games – this year we played exploding kittens and Cards Against Humanity. Cards against humanity is highly inappropriate, but just a complete blast to play. I hope to continue the tradition next year, but also hope to play more than just CAH. I heard there were sodas at the afternoon breaks, but rarely managed to get to the refreshment tables in time to get one. These are relatively minor compared to my criticisms of previous years. The mobile app was excellent this year. I do wish it would have alerts for when one is speaking or moderating a session, and would sync between the Web agenda and the app, but it is by far the best conference app I have seen. The venue was great this year – nice and compact and within walking distance of many restaurants and grocery stores. I don’t think it could get any better than this. Things ran on-time and smoothly. Kudos to the conference planning committee. I’m getting back to the grindstone and leaving the fun of the conference behind, filled with inspiration and ideas to help my clients. Next year, the conference will be in Anaheim, California in early May. Are these presentations available for download or deferred watch? if so, how? I have searched for them and I have found an IDUG page but I see no way to watch them. Perhaps they are only for the IDUG registered ? 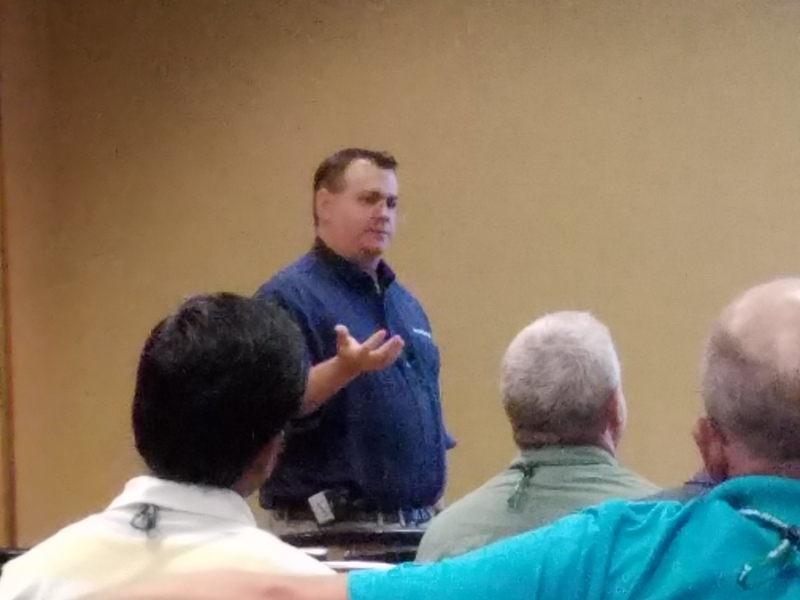 The slide decks themselves are available, and a few were recorded and will be available at random times on the IDUG content blog, but they are mostly not available. 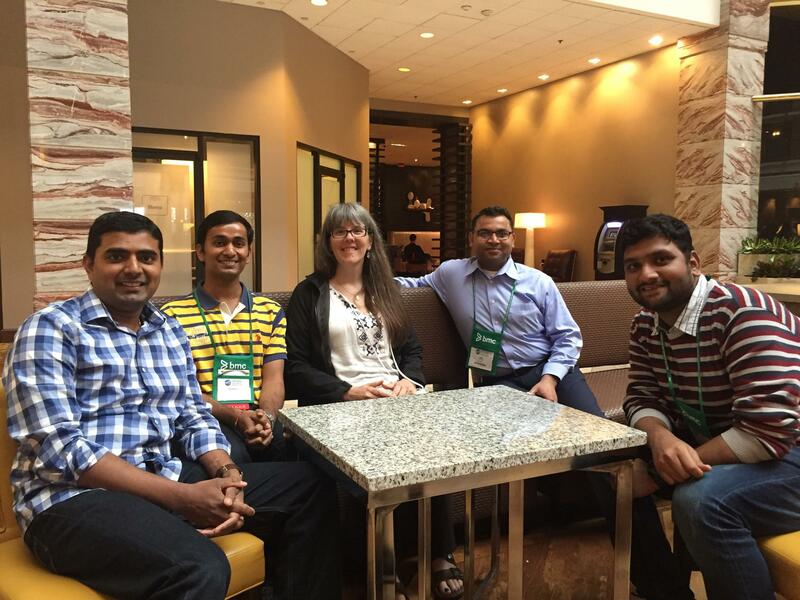 Great Article as usual..It was really nine meeting you at IDUG, missed to click a pic 🙁 .